I had read about this in the news paper about month ago and have finally found some time to read through the site and the project itself in detail. If you are interested in this fantastic project, feel free to visit the site posted underneath the pic. "And the more natural the process by which the storyteller forgoes psychological shading, the greater becomes the story’s claim to a place in the memory of the listener, the more completely is it integrated into his own experience, the greater will be his inclination to repeat it to someone else someday, sooner or later." I am nothing if not a storyteller. My work to date has been concerned with the communication of public and private information to an audience so that it may be retold, distributed. The stories I tell are political dramas, which unfold through my past experience and into the present where they interact with the currency of media as the dialectic of aesthetic pleasure and pain. Through various layers of distribution and interpretation, pictures are drawn using interactive models established through the stories’ (technological) framework where they are revealed and shared. With an audience locked in participation, my story may be retold. The 3rdi is just such a platform for the telling and retelling of another story. 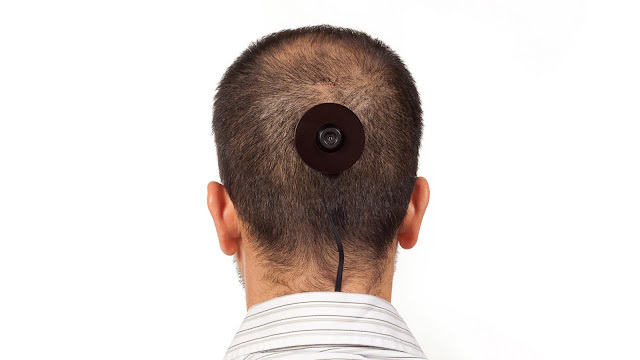 A camera temporarily implanted on the back of my head, it spontaneously and objectively captures the images – one per minute – that make up my daily life, and transmits them to a website for public consumption. During my journey from Iraq to Saudi Arabia, on to Kuwait and then the U.S., I left many people and places behind. The images I have of this journey are inevitably ephemeral, held as they are in my own memory. Many times while I was in transit and chaos the images failed to fully register, I did not have the time to absorb them. Now, in hindsight, I wish I could have recorded these images so that I could look back on them, to have them serve as a reminder and record of all the places I was forced to leave behind and may never see again. The 3rdi arises from a need to objectively capture my past as it slips behind me from a non-confrontational point of view. It is anti-photography, decoded, and will capture images that are denoted rather than connoted, a technological-biological image. This will be accomplished by the complete removal of my hand and eye from the photographic process, circumventing the traditional conventions of traditional photography or a disruption in the photographic program. Barthes has said, "...from an aesthetic point of view the denoted image can appear as a kind of Edenic state of the image; cleared utopianically of its connotations, the image would become radically objective, or, in the last analysis, innocent." It is this 'innocent' image that I wish to capture through the 3rdi. Technically, the 3rdi is an automatic photographic apparatus that is comprised of three different components: a small digital camera permanently surgically mounted to the back of my head with a USB connection, a lightweight laptop which I carry on my body connected to the camera with a USB cable, and a 3G wireless connection to access the internet. The website www.3rdi.me acts as storage and display for the images captured by the camera. The functioning of the apparatus, in theory, is as follows: The camera, through no intervention of the artist, captures an image automatically once a minute and send this image through the USB connection to the receiver (the computer) on my body. The receiver then sends this image through the 3G network to the website, where the images are archived and made available to the public. The 3rdi makes a technological apparatus part of my body and distributes the recorded content openly within space using the internet. The arbitrary imagery captured by the device will retain fractured records and distribute a narrative to be completed by the viewer as their corporeal space is also compromised by the presentation. Benjamin has described the storyteller as one “who could let the wick of his life be consumed completely by the gentle flame of his story.” (Illuminations) In this way I become locked to the story as its teller, passing the interpretive mode to an audience with little context so it may be transformed for their subjective interactions and subsequent expressions. Using this narrative triangle, the work will comment on ways in which imagery is used for the telling and retelling of stories, whether they belong to us or we make them ours.